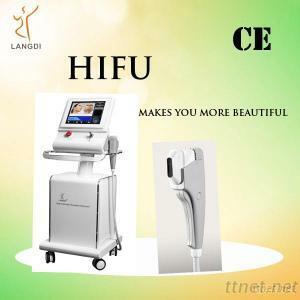 HIFU is from America, which can realize the skin tightening, removing wrinkles & shaping. The advanced point is the machine adopt advanced ultrasonic wave energy to penetrate deep layer, arrive to SMAS layer[Superficial Muscular Aponeurotic System], can make the collagen immediately shrink and stimulate them to in quantity rebirth and recombination, rebuild new collagen fiber network, thus strengthen skin flexibility from bottom layer. This is the only skin tightening instrument with no any wound, no recovery, no convalescence and no multiple treatments at present, which gets FDA Lifting,! The magic effect has approved by around the world beauty authority institution.